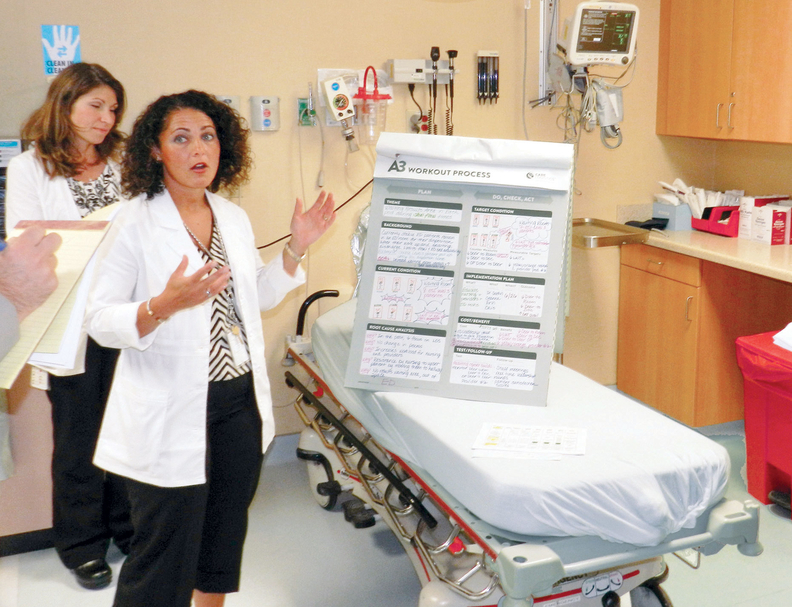 Staff members at Mercy Medical Center discuss elements posted on a Care Connect Unit Board. The boards are on display in every inpatient unit at Mercy. Four years ago, a visit to the emergency department at Mercy Medical Center for a non-life-threatening condition took more than 3½ hours from the time patients walked through the door until the time they were treated and sent home. “The patient flow at that time was pretty difficult—lots of gridlock, inpatient beds full and patients held in the emergency room,” said Dan Moen, CEO of Sisters of Providence Health System, which owns the 343-bed safety net facility in Springfield, Mass. The issue of long ED waits came to a head at a challenging time for Mercy. Massachusetts' 2006 healthcare reform law had increased demand for services, and the number of Mercy's ED visits spiked, reaching more than 75,000 visits a year by 2011. The increased patient load led to longer wait times, resulting in 4% of patients leaving the ED before receiving treatment, compared with the national average of 1%. Moen said some Mercy departments launched initiatives to reduce ED wait times, but it became clear a more comprehensive approach was needed. So in 2011, Moen hired Care Logistics, an Alpharetta, Ga.-based consulting firm that helps hospitals improve clinical operations and patient flow. He chose the firm after visiting Mercy St. Vincent Medical Center in Toledo, Ohio, where he observed the firm's success in improving coordination between hospital departments to shorten ED wait times. More hospitals are hiring consultants to improve efficiency of their clinical services, including emergency and surgery departments and specialty clinics. Mercy is one of a growing number of hospitals that have turned to healthcare consulting firms for help to streamline and improve their clinical operations. Increased financial pressures associated with declining inpatient volume, rate pressure from insurers, and Medicare performance-based rewards and penalties have forced many health systems to search for ways to improve quality and reduce costs. Meanwhile, other systems, such as Cook County Health and Hospitals System in Chicago, have chosen to address patient-flow issues on their own. “We're starting to see hospitals embrace the use of data and efficient processes much the same way other industries have done for years,” said Brian Sanderson, managing principal for the healthcare service group at Crowe Horwath, one of the nation's largest healthcare consultants. 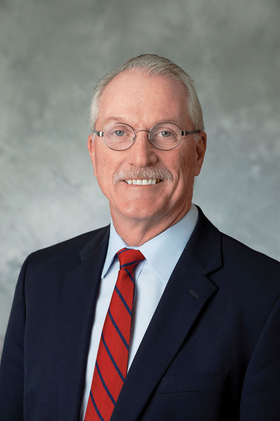 Dr. John Flynn, co-director of the Osler Center for Clinical Excellence at Johns Hopkins University in Baltimore, said hospitals have hired consultants to improve the efficiency of their clinical services, including emergency and surgery departments and specialty clinics. “There's a tremendous push for delivering services, delivering them more efficiently and driving waste out of the process,” he said. Costs for such services can range from tens of thousands of dollars for interventions that last a few weeks, to several hundred thousand or millions of dollars for more in-depth processes that can take as long as a couple of years. Tom Brunelle, a regional vice president for Care Logistics, said his firm's consultants may continue to work with a hospital for several years after the initial process changes are implemented. The cost of these consulting services may be a deterrent for some health systems, Flynn said. The total number of healthcare consulting firms has increased at a rate of about 1.2% annually over the past five years for a current total of more than 40,000 firms with about 80,000 employees, according to a March report conducted by market research firm IBISWorld. It is unclear how many of those 40,000 healthcare consulting firms engage in process and patient flow consulting. Independent specialty consulting firms are being acquired by larger, general consulting companies to gain entry into a market with profits expected to grow at an average rate of 4.3% in 2015. Total revenue is projected to grow by 5% a year to more than $14 billion by 2020, according to IBISWorld. Despite the trend toward consolidation, the consulting industry remains fragmented. In 2015, the three largest firms accounted for a quarter of total market share, with more than 90% of companies composed of fewer than 10 workers. In addition to Crowe Horwath, other big players in healthcare consulting include Deloitte Consulting, which holds the largest share of the market at 10.5%, and IMS Health, which is second with an 8.5% share. Not surprisingly, hospitals and health systems are key clients for those consultants, accounting for more than 38% of their business, with pharmaceutical companies second at 19%. One of healthcare consultants' major services is “strategic management,” which makes up more than 36% of their business. Identify hospitals that have worked with a particular firm and find out how well that firm helped with finding solutions. Look for consulting firms with extensive experience in healthcare. Hospitals debating whether to implement change strategies should consider whether their staff has the expertise to undertake a full-time project, factoring in loss in patient-care productivity. Change should focus on improving coordination and communication between hospital departments to shorten patient wait times. Healthcare consultants often use quality improvement and change-management strategies drawn from Six Sigma and Lean. These quality and efficiency improvement methods have been adopted by an increasing number of healthcare systems over the past decade to boost productivity and reduce costs. Mercy began working with Care Logistics on its systemwide transformation in 2012. It added 24 nurses to serve as clinical-care coordinators. They are on duty around the clock to supervise the logistics for each admitted patient throughout their stay. A central hub is set up on each floor, where length of stay and estimated discharge time is monitored and opportunities to reduce wait times for tests and other services are identified. Ben Sawyer, executive vice president of Care Logistics, said the goal is to reduce “white space”—the time during a patient's stay when no clinical services are being provided because staff are waiting for patient transport, lab tests, or for a bed to become available. Reducing this dead time shortens overall length of stay, which in turn frees up beds for patients being admitted from the ED, Sawyer said. Moen said Mercy's partnership with Care Logistics has paid off by shaving an hour off the amount of time ED patients spend being seen, treated and discharged. These efforts also have reduced the average length of stay for admitted patients by a day. These changes have increased the number of patients who report being satisfied with their experience in the ED, from 50% to 86%, and have contributed to a rise in staff morale. Like Mercy, many hospitals have focused their streamlining efforts on the ED, which can generate substantial revenue if it is efficiently operated. But if patient flow is backed up and a significant percentage of patients leave without being seen, revenue drops. Hospitals particularly struggle with how to quickly identify patients who don't truly need emergency services and can be treated through urgent care or some other less-acute level of care. Some hospitals and health systems have implemented quality-improvement and cost-reduction strategies on their own. “We felt an internal process was much more effective in moving things through,” said Dr. Jeff Schaider, chairman of the department of emergency medicine at the Cook County Health and Hospitals System, the safety net healthcare network for the Chicago area. Schaider said he and other system leaders implemented a patient-flow strategy out of a belief that they had the data and other capabilities to carry out a plan on their own. The in-house process encouraged staff to take greater ownership of the process, said Peter Daniel, chief operating officer for the Cook County system. “I think the team working together made a big difference to the commitment to improve on a lot of these activities,” he said. The ED at the system's largest acute-care facility, Stroger Hospital, sees more than 110,000 patients annually. It has one of the longest wait times of any facility in Illinois—an average of more than two hours for patients with non-urgent conditions, according to data from the CMS. In 2013, the share of patients who left the Stroger ED without being seen was about 10%. Two years ago, Stroger Hospital leaders began a major restructuring that called for a virtual elimination of the ED waiting area. Instead, the hospital began the practice of immediate bedding—sending patients directly to an available bed in the ED where they are triaged by a nurse and seen by a physician. The hospital also assigned a physician to quickly evaluate more-urgent cases as well as to assess, treat and discharge patients whose conditions were not serious. Efforts also were made to reduce the time it took to get lab-test and diagnostic-imaging results, including the installation of additional imaging machines. Daniel said that he's pleased with the results so far but that his hospital still has work to do to further reduce ED wait times to become more competitive with other hospitals. Flynn at Johns Hopkins said some hospitals that have hired outside help to solve patient-flow issues have found that consultants tend to use a one-size-fits-all approach, without first getting a solid understanding of the client facility's unique culture. Also, some consultants without extensive healthcare experience may recommend cost-cutting strategies that hurt quality of care, he added.